1 tsp red chilly powder. Marinate chicken pieces with all the ingredients except oil,keep for 2 hours. Heat oil in a pan add chicken pieces and fry till golden brown. HORRIBLE DISH/RECIPE! I tried this recipe and it tasted really bad especially because of the gram flour. I would never make this dish ever again. Do people even try their recipes before they submit to khanakhazana? I WONDER! 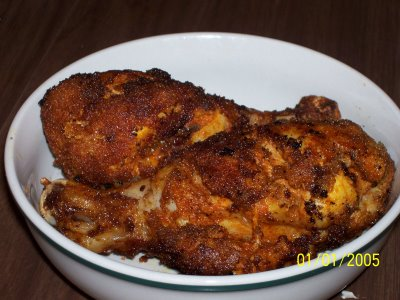 Yummy fried chicken just thinking of fried chicken makes my mouth water.Thankxxx. Seems like a wonderful recipe. Thanks.